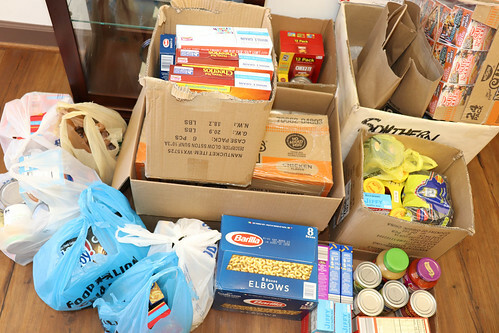 Hughesville, MD: The Southern Maryland Association of REALTORS® (SMAR) Community Relations Committee organized its first Food Drive Challenge of the year that ran from January 14th – February 22nd. Even though food is collected year-round at SMAR because hunger happens every day, a special food drive was organized to replenish food pantries after the holiday season. REALTOR® and Affiliate Member offices of SMAR were challenged to collect food for a period of six weeks and then drop off their collections at the SMAR office in Hughesville. In total, $790 of food was donated! “Thank you to all individuals who donated and to the following companies who participated: Century 21 New Millennium, Home Towne Real Estate, Lakeside Title Company, Leonard Realty, Long & Foster Real Estate, RE/MAX 100, and RE/MAX Closers,” said Terri Davis-Herbert, Committee Chair. “As Realtors® in our community, we strongly feel that giving back is part of our DNA and essential for our neighborhoods,” she continued. SMAR’s Community Relations Committee selected various food pantries throughout Southern Maryland to receive the donations – Chesapeake Food Pantry, Charles County Children’s Aid Society, Joe’s Place, Helping Hands Food Pantry, and the Southern Maryland Food Bank. As food collection continues, other various food pantries in Southern Maryland will receive donations. Please check out other community initiatives here on our website.